I got a PC and Commander Keen 4 on it when I was about 4 years old. I was a very little kid with undeveloped perception and memory and strong imagination, so occasionally I was just imagining things and thought that something happened to me and believed in it for many years. Later I realized that these things were technically impossible at all, but I'd like to share them with you anyway. 1. Bugging through wall into water pool in Sand Yego. I always wanted to get into a water pool under Sand Yego (as I expected sometging to be here like in Lifewater Oasis). Once I walked into the secret that is just at the level start (it can be a bit tricky to get out of it). I started to rapidly press many different buttons on keyboard like mad, I wildly jumped in it and also tried the Ctrl+Down combination. And suddenly I somehow fell through the wall and ended in the water on the bottom, which killed me on touch (or probably killed me when fell past the visible bottom edge). 2. Getting a lifewater flask in BWB Megarocket level. Amost everyone knows that if you have less than 5 shots and enter a level (including BWB Megarocket), there will be an extra Neural Stunner for you just in the beginning on the level. But I remember that once when I had 0 lives, I enetered a BWB Megarocket level and there was an extra Lifewater Flask for me. 3. Entering a non-existent level. 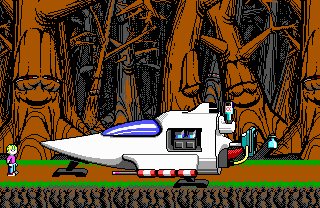 I always thought that when I played Commander Keen for the very first time, I managed to enter and play a level which is located where keen stays on the picture. So long time I thought there was some hidden level and often ctrl'd that place. 4. Two secrets connected in Lifewater Oasis. In Lifewater Oasis there is a secret (with a long fall-through shaft) which gets you into the lowest area (just above the water pool). In the leftmost part of the higher area there is a tiny secret in the ceiling where is hidden a Doughnut (2000 points). I thought that the tiny secret in ceiling was connected to the shaft, so I could either get to the second lowest area from the shaft or get from the second lowest area to the area under it. I believed that once I got through the connection. 5. Keygems were not preserved in a savegame only sometimes. It is a well-known bug that in a specific version of CK4, the keygems are not saved in a savegame. When I was a kid, this was happening to me (and I could not finish a level because of it), so I was afraid of it and often saved my game just before picking up a keygem. But I always thought that this happened just randomly and sometimes my keygems were properly saved. Concluding from the fact that I saved and loaded game very often in harder levels (pyramids), and if the keygems were never part of a savegame, I would have big problems beating the levels, but I didn't. 6. Suddenly appearing just in front of the Hand Pyramid. I didn't know how or why, I just suddenly appeared to stand before Hand pyramid. I don't know whether I just unknowingly discovered the inchworm trick or not, I also probably didn't even enter the pyramid. I really think it was just a result of imagining things. I knowingly discovered the real way to the secret level many years later. Hisymak wrote: I didn't know how or why, I just suddenly appeared to stand before Hand pyramid. I don't know whether I just unknowingly discovered the inchworm trick or not, I also probably didn't even enter the pyramid. I really think it was just a result of imagining things. I knowingly discovered the real way to the secret level many years later. Same over here as well. I have no idea when I actually discovered the flying foot nor do I remember how I descried the insights of those inchworms (for quite some time I avoided them cause I thought they might be harmful as well...). What I know for sure is, that I worked these secrets out myself. But my memory really won't help me finding some aided recall. A lot of these sound surprisingly, if vaguely, relatable. The one thing that comes to mind for me, which I'm fairly sure actually happened, was an inconsistency in Keen1 jump height. 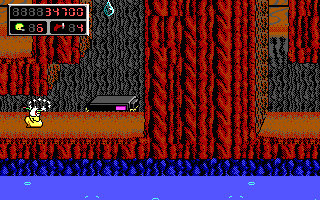 I first played Keen1 version 1.0 on an old Amstrad PC and I'm fairly sure that on random occasions Keen's jump height was an extra square higher than usual. I would have tried that Keen1 version on modern computers and this phenomenon didn't happen at that point. I have one theory. Things like this could be caused by a hardware failure or memory corruption. Once I owned an older PC with DOS which had somehow damaged memory controller. On each boot it wrote "Memory test fail" on the boot screen and I needed to press F1 to continue. Probably all the games which used just 640K of memory were running flawlessly on it. However some more advanced games requiring more memory (mostly 3D games) either did not start at all, or were corrupted during playing them. Most notably Quake 1 - the collision detection was totally messed up, I was falling through wall and bridges and it was unplayable. I tried to exchange the memory modules with others but it didn't help, but reducing the memory size changed the behavior. I think something like this could have happened to me or someone else in Keen. I quite believe that 1) really happened to me, however 3) is obviously not true, I definitely imagined it. So anything else from you you'd like to share? "1. Bugging through wall into water pool in Sand Yego." Methinks this is a consequence of the engine not doing any collision checking outside of the screen area. No, there's actually a hidden pole in that area. If you don't believe me, use GalaxyView v1.7 and see for yourself. All poles are marked by a "0001" on yellow background (press 5 to turn the yellow numbers on/off in the level viewer). 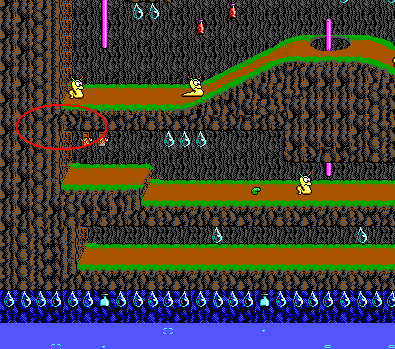 By holding the down key in that area of the level, you make Keen slide down on the pole, which probably allows Keen to slide down through the blocking tiles at the bottom of that hidden area. Just like Keen can slide down through the holes with the pole in the middle, which are perfectly solid when standing/walking on them. Very interesting. I wonder, was this intentional or a remnant of a removed level area? Probably just an oversight in the level design. Neither TED nor the games actually display tile attributes like poles etc. A good explanation. Could you check the level "Lifewater Oasis", using the program? Is there a way to flasks at the bottom of the level? On hard there's a skypest flying around there in the sky. If you have patience and you're lucky, it also can teleport down there. Good! So that was definitely not a false memory. I really believed it happened to me, but I could do it only once in my life and never was able to reproduce it. Thanks for recording and explaining it.